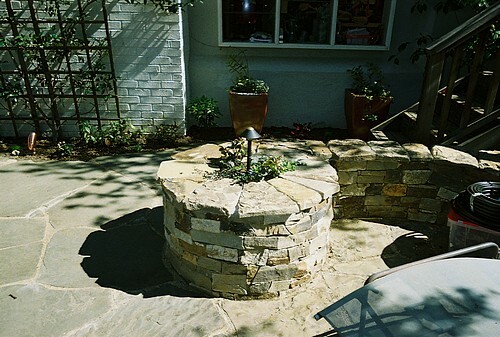 A flag on sand patio with a fieldstone brick veneered walls. There are two such walls, each with a circular feature at each end built after a "ying yang" fashion (Design shown below). 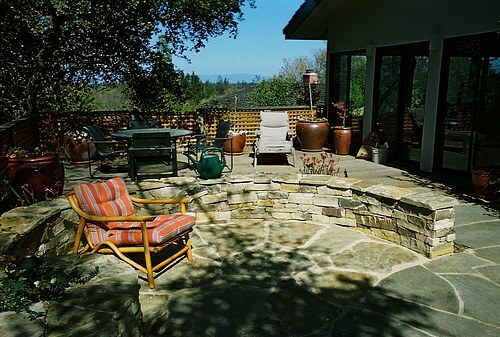 This picture shows how the walls wrap around and it shows the different textures of flagstone used for the patio. A rough textured stone was used for the enclosed areas and a smoother Con.blue type was used as a pathway from the house to the garden gate (gate shown under "gates" tag)..
Each low wall ended with a circular structure at one end. 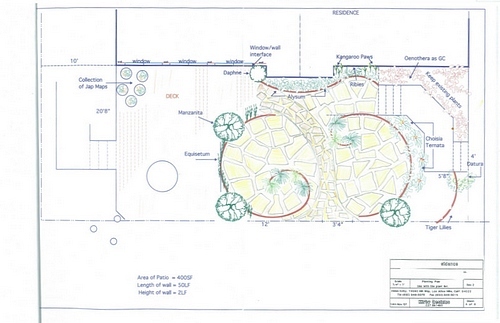 The centers of the circles were hollow and could be filled with soil for a plant or was also wired for a low voltage elecrical landscape light.